I just finished reading the recently released book The Defector, by Daniel Silva. Silva is the best selling author of thriller and espionage books, having written 12 thriller novels, many of which have reached the New York Times best selling list. A fan of the thriller genre, I’ve read and enjoyed Silva’s previous 11 books and as usual, quickly purchased The Defector when it was released in July. 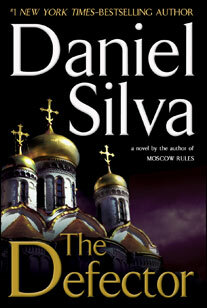 The Defector continues the Gabriel Allon series, the Israeli intelligence hero that Silva has used in his last 8 books. Here are a couple of initial thoughts, without giving away the entire story. As usual, an entertaining read that I was able to finish in about a week —a sure sign that I enjoyed the book. While this is the 8th book that I’ve read that features Gabriel Allon, this one felt more similar to a previous book in the series, the predecessor book Moscow Rules, than any of Silva’s other books. The Defector continued the storyline from Moscow Rules in which Russian tycoon Ivan Kharkov is Allon’s nemesis. The conflict and climax scenes from this book are set in London, Switzerland, and Russia leaving a very similar feeling for the reader as Moscow Rules. Allon feels a bit more dark and hardened in this book than in the previous books. In his role as the super Israeli intelligence agent, he has always had to kill terrorists, mercenaries, assassins, bodyguards, and other potential adversaries, but this time, it clearly felt that he killed or authorized killings before he had to. That may be reflective of the greater level of desperation than he was faced with than previous story lines. In previous books, Silva often had Allon restoring noteworthy paintings, a skilled restorer who had rebuilt paintings even for the Vatican. The restoration typically was the lead in prior to an incident that required legendary retired Israeli intelligence chief Ari Shamron to call upon Allon to save the day. In The Defector, the restoration experience is very brief and seems like an afterthought, unlike the other books. Again, possibly an indication and foreshadowing of an even more desperate situation than in the previous Allon books. London continues to be one of Silva’s favorite settings for havoc—in the past, Middle Eastern terrorists mobilized operations and plans here while now Russian oligarchs and the KGB orchestrate potential kidnappings. Silva typically has some twists and turns that aren’t easily anticipated and in this case, the person executing the best twist in the book was surprisingly, not Gabriel Allon. The movie rights to the Gabriel Allon series of books is still under negotiation. Given the success of the Bourne Identity series starring Matt Damon and 24, this will certainly be a successful movie series. Particularly, given the focus on an Israeli intelligence hero and the depiction of the Israelis as the toughest, emotion free, do what other agencies wouldn’t do agency, I think many movie audiences would be attracted to this series. Overall, another fine effort from Silva. While I wouldn’t rate it as highly as some of his previous books, I believe he still is amongst the top of the thriller genre and I look forward to his future books.